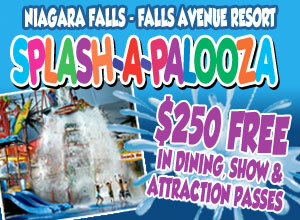 The Falls Avenue Resort, Niagara Falls Ontario is the place to be for Family Day and March Break. The largest Indoor Waterpark and Hotel Complex in North America, the Resort has a special bonus for guests arriving during the break – $250 in attractions, dining and show passes – Free! Guest who reserve either a Fallsview Indoor Waterpark Hotel Package or a hotel stay at one of the 4 premier hotels on Falls Avenue and arrive February 18-21 or March 11-20, 2011 will receive $250 in bonus passes for 4 guests. The “Splashapalooza” bonus includes: a $40 Fallsview Dining Gift Card, passes for 4 guests to Adventure City attractions featuring Tour Bus SWAT Team, Combat Bumper Cars, Wild Safari Mini Golf, Jungle Fun Funhouse, MGM Movie Experience, and two movie each at 4-D Moving Theatre. In addition, the Fallsview Restaurant at the Sheraton on the Falls, will once again welcome families with their popular kids eat free offer (with a paying adult). The 20 acre Resort will also extend free family activities once again. Plan Your Fun has become a fixture on the resort during the Family Day weekend and March Break. Events include free family friendly movies at Planet Hollywood, Face Painting, meet and greets with Pink Panther and the Hershey Kiss, and nightly shows featuring Master Hypnotist Danny Zzzz.